Wondering how to get a second life out of those pretty liquor bottles that once adorned your bar? So was I after the hubby finished off his Jack Daniel's Single Barrel (with the help of friends) and was preparing to throw it in recycle. In a desperate attempt to convince him not to toss it, it dawned on me; why not use it to class up the bathroom. 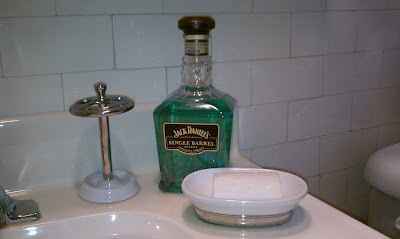 Specifically, I refilled the Single Barrel bottle with green mouthwash. While I brought this bottle upstairs because it's pretty, he just loves the fact that every morning he's taking a swig from a Single Barrel bottle. Can't get more manly than that. Another, less manly option: Bubble bath. It's probably the only safe way to use these bottles in the actual tub as BB is typically applied before you get in when your hands are still dry. Of course, this may not be a great idea if you share the bathroom with little ones. Both for breakage and responsibility purposes. What a cool idea to recycle liquor bottles! I'm sure my Orange County dentist would be okay with this especially if I had thoroughly disinfected the bottle. Thanks for the idea. You're certainly right Jen. Most dentists would approve. Who knew you could bring crafting ideas into pretty much any profession? Glad you like the idea! executing this action, you could intimate tumblr.com/ the mistakes to the Live NetTV team check this site in a fraction of a second. We have How to Download Live NetTV on Android APK, iOS & Computer got magnificent Bored to stream the Live NetTV Live NetTv application on your cellphone Live NetTV Download Are you super thrilled to enjoy.